Sending the kids off to college this fall? Local 1325 might be able to help. Apply for our bursary by August 31st! 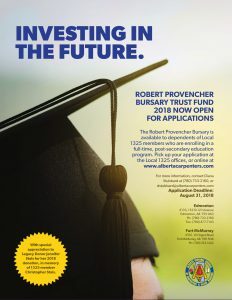 The Robert J. Provencher Bursary is available to dependents of Local 1325 members who are enrolling in a full-time, post-secondary education program. Pick up your application at the Local 1325 offices or download it below. Email dstubbard@albertacarpenters.com for more information. Looking for work in scaffolding right now.